New: Creates a brand-new document in the native file format. For example, in InDesign, a new INDD (the extension for InDesign documents) file is created by choosing File→New→Document. You can sometimes choose the type of new file you want to create. Open: Opens a dialog box where you can choose a (supported) file to open on your hard drive or a disk. Close: Closes the current document. If it has unsaved changes, you’re prompted to save those changes first. Save: Saves the changes you’ve made to the current document. Save As: Saves a new copy of the current document. Import: Imports a file, such as an image or sound file, into the current document. Export: Exports the current data to a specified file format. You can sometimes select several different kinds of file formats to save the current data in. Copy: Copies the selected data to the computer’s Clipboard. Paste: Pastes the data from the Clipboard into the current document. Undo: Undoes the most recent task you performed in the program. For example, if you just created a rectangle, the rectangle is removed from the document. Redo: Repeats the steps you applied the Undo command to. For example, if you removed that rectangle you created, the Redo command adds it back to the document. Zoom In: Magnifies the document so that you can view and edit its contents closely. Zoom Out: Scales the view smaller so that you can see more of the document at a time. Help: Opens the Help documentation for the current program. Some of them open dialog boxes — this type of option is typically indicated by an ellipsis that follows the menu option. The contextual menu is an incredibly useful, quick way to make selections or issue commands, and it’s available in all kinds of programs. Contextual menus include some of the most useful commands you may find yourself choosing repeatedly. A contextual menu is context-sensitive and opens when you right-click (Windows) or Control-click (Mac) something in the program. Contextual means that which options appear on the menu depends on which object or item you right-click (Windows) or Control-click (Mac). 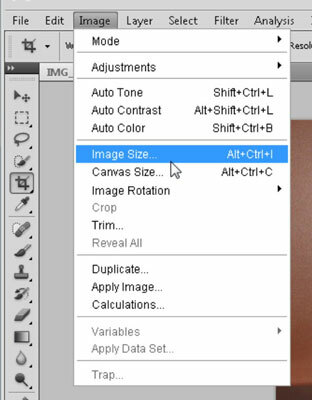 For example, if you open a contextual menu when the cursor is over an image, commands involving the image are listed on the menu. However, if you right-click (Windows) or Control-click (Mac) the document’s background, you typically see options that affect the entire document instead of just a particular element within it. You can therefore select common commands specifically for the item you’ve selected. 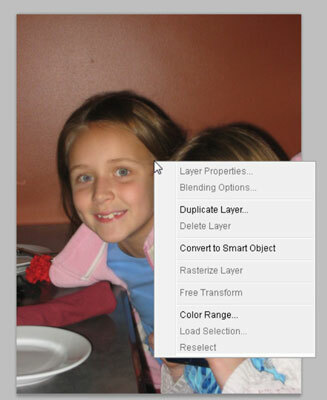 This is the contextual menu that appears when you right-click (Windows) or Control-click (Mac) an object in Photoshop.